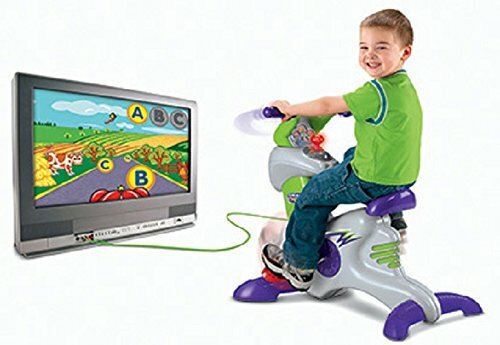 Fisher-Price made a high-tech exercise bike for kids who like to game. During this year's Consumer Electronics Show, Fisher-Price unveiled the Think and Learn Smart Cycle. It's a miniature exercise bike with a tablet stand - and it's meant for children ages three to six. (This an upgrade to the previous Smart Cycle, which requires a cable to hook up to the TV.) With "Smart Cycle", kids can play apps while also getting in exercise - and they can do it all from the comfort of home. We got a hands-on look at the new Smart Cycle, which is entirely wireless, at CES 2017, though it was far too small for us to actually try out. A bigger version was also on display at the show with an adult riding in order to properly demo how a child would use it. The idea is that kids basically pedal to play. The $150 bike comes with one free game, called Mission to Tech City, which you can download on a tablet. The app features age-appropriate gameplay based on a curriculum of math, science, and social studies. Additional apps cost $5 each and include interactive experiences from Nickelodeon, such as a SpongeBob SquarePants app that aims to educate children about science and social studies. Parents can download the apps on Android or iOS and pair the bike to a tablet or a streaming TV device via Bluetooth. During the demo, we saw how kids could pedal forward or backward and use the handle bar to steer. Also, the bike is adjustable, so it can grow alongside a child. If you're looking to give your kid some guilt-free screen time, Fisher-Price thinks Smart Cycle is an ideal solution, though there will likely be plenty of parents out there who think kids should just put their tablets down and ride real bikes outside. Still, Smart Cycle costs $149.99 and will be available from June 2017.